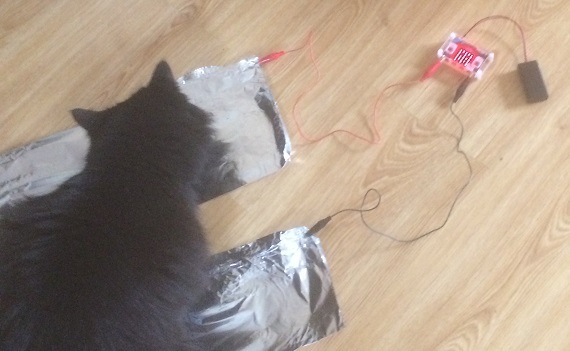 This project is a simple prototype for a Feline Detection System (FDS). The FDS is meant to detect the presence of a cat. You will need a micro:bit. You can do this from USB power but it will be easier to set up with an optional battery pack. You will need two cables with crocodile clip connectors. You will need to make two electrical contacts for the test subject to touch. Tin foil is my product of choice. You must respect your test subject and show due regard for his/her safety. Felis Catus is not generally known to work for free. You will need something to interest the subject. A supply of cat treats may be also be required. Clip a crocodile from pin 0 to one piece of foil. Clip the other one to GND. A simple program is used. All that happens is that an image is displayed on the LED matrix when the cat touches both contacts at the same time. Bait the trap and then wait. The test subject places his back legs on the first electrical contact. 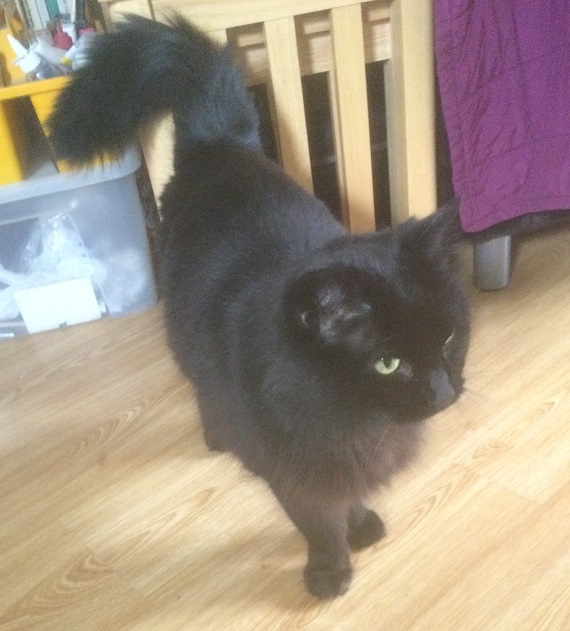 As he eats the cat treats, he makes a connection to the second piece of foil with his front paws or with his tongue. The light goes on to register the presence of a cat. Obviously, there could be more action when the cat is detected. Cats react differently to buzzer noises. Some are captivated by melodies, some don't like it at all. Notice the way that the sensor is designed. Two conductive pads are placed close enough together so that a living being can complete the circuit through natural movement. Place the pads so that a footstep would complete the circuit and you have a stomp pad. Anything that touches both pads simultaneously is going to set off the switch. Experiment away.